Most visiting fans who opt to drink in the City Centre usually arrive by train and remembering their visits to the Dell often go into the pub opposite the Station, The Victory. Well they used to, as the Victory has recently closed. You now have two choices as you head up the Hill, if you cut through the monstrous tower block of flats you will find two bars next to the Mayflower theatre, Joe Dafloes is a converted Church and is likely to be quiet on matchdays, whilst directly opposite is The Encore, both offer a quiet drink for the away supporter. Venture on up the hill in the direction of the big clock tower and you are come to the City Centre itself, and there are many choices of the usual theme/chain pubs although it has to be said not many traditional boozers here. As you pass the Clock you have a set of traffic lights, running to left & right is Above Bar, the main drag through the City Centre, the ground is straight on, or you can opt to go either left or right and you dont have far to go for a drink. If you turn left at the lights, about 50 metres up on the right is the Spitfire which is home fans only, but there are other bars that will let in away fans as you go on past the Spitfire including the Frog & Parrott a reasonable Pub and popular with the football crowd for its drinks offers and multiple TV screens showing the live matches, they will let away fans in providing they arent in large numbers and not rowdy, bouncers as well as the touring police spotter squads are quick to turf out those who get a bit rowdy. In the area of Above Bar by traffic lights you have a few fast food oulets including KFC, Subway and a chinese restaurant. Turning right at the Traffic Lights is busier on Matchdays as you are heading towards the City Centre proper, but in truth a more volatile element of the Southampton support are to be found here so its not recommended for large groups with away colours on, although most teams fans will have no problems. First pub is Yates, every City now has one and this is no different from the rest, the police tend to designate this as an away pub and keep a close eye on it. 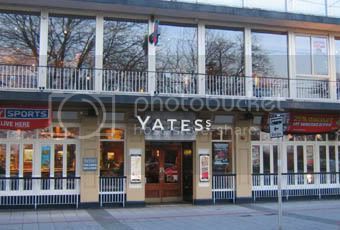 Next door is the Hogshead, a bar like Yates with two floors, reasonable enough for a drink, usual selection and does food as well, often gets visiting supporters in who are turned away from Yates. 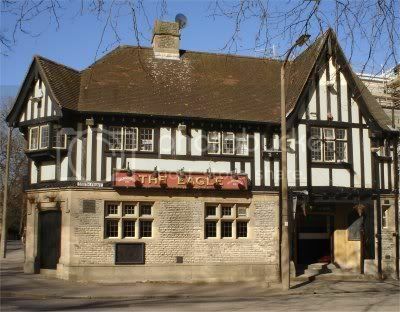 Opposite is Que Pasa, formerly The Toad In The Park, not recommended for away supporters due to a sizeable youth element of the Saints support popping in for a drink, again an expensive pre club bar type of place. Heading down the road from here, you can see the roof of the Stadium behind the large tower block about half a mile ahead, at the crossroads however you used to come to the Eagle. now however its a convenience store so if you fancy a drink in the park opposite then you can buy a few tins and soak up the sun in the summer. To the left is The Angel, however this is strictly home fans only and not a place for away fans. Returning to Above Bar and Yates the far end of the shopping Precinct is usually a little isolated on Match Days for away fans, near to it is a couple of other pre Club bar type places whose names arent worth remembering. 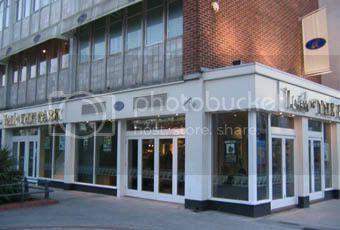 The Standing Order, another Weatherspoons bar is popular due to its cheap prices and can get busy and also has a SKY TV screen and does food. Those hankering for a burger will find both Burger King & McDonalds at either end of the precinct. In summary, the City Centre has a lot of big Chain Pubs, its lively and if you avoid the one or two pubs mentioned you should be fine, but if you want something a little more relaxed and different you should try one of the other areas.